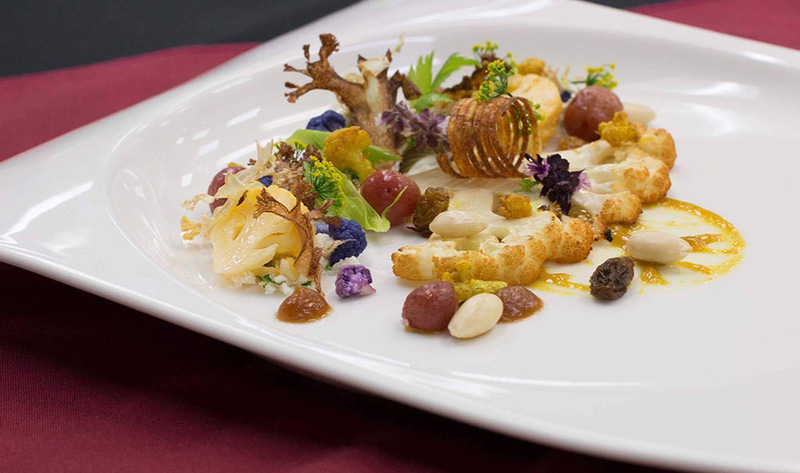 McMaster Hospitality Services executive chef Paul Hoag’s artistically arranged, creatively plated presentation of cauliflower prepared six ways — yes, that is half a dozen — landed him eighth place in the coveted top 10 in the World Gourmet Society’s “Best Plate” video competition. Six kinds of cauliflower cuisine, you ask? Yes, and the fully vegan plate contained not one shred of cheese to prop it up, though it did have pickled grapes, almonds, a potato spiral and date puree. Hoag’s three-minute video was Canada’s lone contender against fancy dishes from around the world, including Italian chef Gabrielle Vannucci’s slick, artfully lit panna cotta black forest gateau. Vannucci’s blockbuster video — featuring dry ice, a blowtorch and a whimsical piano score — took home the top prize last week at the Chefs World Summit in Monaco. Hoag’s video focused on a lot more than just his prowess with produce. His entry is only part plating — the first half of it is a fond tribute to McMaster and to Canada. Only after his voiceover asks, “So what is Canadian food?” does he cut to the actual plating. And that’s all for the best: Besides creativity, artistry and sheer cooking skill, “the culinary heritage of the chef’s country of origin, the team in the kitchen, their techniques, the kitchen, and ingredients are all excellent inclusions for the short story as they create their most representative and distinctive plate,” the organizer’s website says. Hoag also placed third in Canada in qualifiers for the World Chef Challenge. Video credit: Karen Graham, front of house catering, and Nathan Alston 3rd year apprentice. Call it cauliflower power. McMaster Hospitality Services executive chef Paul Hoag’s artistically arranged, creatively plated presentation of cauliflower prepared six ways — yes, that is half a dozen — landed him eighth place in the coveted top 10 in the World Gourmet Society’s “Best Plate” video competition. Six kinds of cauliflower cuisine, you ask? Yes, and the fully vegan plate contained not one shred of cheese to prop it up, though it did have pickled grapes, almonds, a potato spiral and date puree. Hoag’s three-minute video was Canada’s lone contender against fancy dishes from around the world, including Italian chef Gabrielle Vannucci’s slick, artfully lit panna cotta black forest gateau. Vannucci’s blockbuster video — featuring dry ice, a blowtorch and a whimsical piano score — took home the top prize last week at the Chefs World Summit in Monaco. Hoag’s video focused on a lot more than just his prowess with produce. His entry is only part plating — the first half of it is a fond tribute to McMaster and to Canada. Only after his voiceover asks, “So what is Canadian food?” does he cut to the actual plating. And that’s all for the best: Besides creativity, artistry and sheer cooking skill, “the culinary heritage of the chef's country of origin, the team in the kitchen, their techniques, the kitchen, and ingredients are all excellent inclusions for the short story as they create their most representative and distinctive plate,” the organizer’s website says. Hoag also <a href="https://dailynews.mcmaster.ca/article/mcmaster-chef-places-third-in-world-chef-challenge-qualifier/">placed third in Canada</a> in qualifiers for the World Chef Challenge. https://www.youtube.com/watch?v=MAlemqUl2q8&amp;feature=youtu.be Video credit: Karen Graham, front of house catering, and Nathan Alston 3rd year apprentice.